In 1902 the two-story Concert Hall, one of the largest rooms in the Alexander Palace, was converted into two new rooms for Nicholas and Alexandra, as well as more space for the Imperial children upstairs. The playroom was originally designed for the Grand Duchesses. As the girls got older and more mobile Alexandra decided that a big playroom was needed for her children since there were few places they could play in the palace that were safe and secure. "..On Christmas there were usually three fir-trees decorated in Tsarskoe Selo - there was one downstairs in the Empress's Big Living Room, another one upstairs in the nursery and the third one also upstairs in the passage and was meant for the Palace's servants. The first fir-tree to be lit was that in the nursery and it was the time when the children got presents. 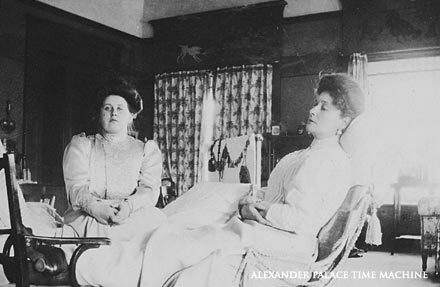 Sometimes their presents were very expensive but the Tsar's children never thought of how much they might cost. They were equally happy when they got a small crafted thing or a cheap toy. They could use their costly presents only during official ceremonies. 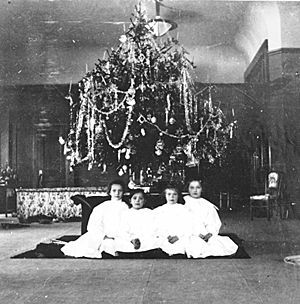 Left: The four Grand Duchesses in front of their tree in the playroom. Aleksey was often given tin soldiers, miniature tanks, etc. He liked to play with them and Anastasia who was three years his senior and a naughty child, used to tease him breaking the even rows of soldiers after which she stood in the posture of a victor on the battle field. At first Aleksey got very offended but then he stopped paying attention to his sister's tricks. Once Aleksey got a clockwork train for Christmas. He and his father often played with it making it stop suddenly between two stations or making train crashes, etc. The second fir-tree to be lit was that for the servants. They also got presents - souvenirs and money. Later the same evening the Tsar and the Tsarina went to the Big Living Room to their fir-tree. They usually got a lot of presents from their relatives living both in Russia and abroad. 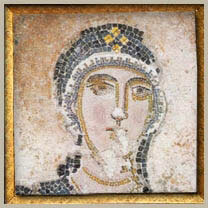 The Tsarina sent her maids-of-honour a miniature fir-tree and gifts. The holiday was crowned with a church service. The Tsar and the Tsarina took their children either to St.Petersburg to the church of the Anichkov Palace, residence of the widowed Empress, or to Gatchina if the widowed.Empress was there. On the next day the fir-tree was lit in the Manege of Tsarskoye Selo for the regiments guarding the Palace. Each private got a gift of silver money; officers got costly presents. The presents were handed to them by the Grand Duchesses." After Aleksey was born and got older the playroom became primarily the his domain that he shared with his favorite sister and confidant, Anastasia. They were near in age and natural playmates. The Imperial children had a lot of toys which grew enormously over the years. Family members, military divisions and government officials gave the children toys on Christmas and other special holidays. Ambassadors and state ministers frequently brought gifts for the children when they were received by the Tsar. This gave the Tsar a great deal of pleasure, particularly when the present was for Aleksey, since he was very proud of his son and liked to see others fuss over him. 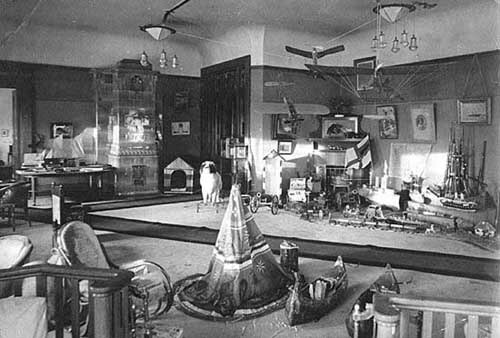 This picture shows the Playroom when the palace was a museum. Aleksey's toys were kept in storage most of the time and would never have been seen like this. In the days the Romanovs lived in the palace the room was very tidy and neat. They would be brought out as requested for that day's playtime and returned afterwards. Here can be seen, ships, plans, a giant toy dog on wheels, a dog house for the Tsarevich's real dog, a tee-pee, tom-toms and canoe, a train, a cannon, as well as a miniature guardhouse for the little Tsarevich to play soldier in. Aleksey often took his meals here and his bed was sometimes moved into the playroom when he was ill. The doors in the far corner lead to the passage and the ceramic stove to the left of the door is in Neo-Slavic design. On the far left a door leads into the Tsarevich's private rooms.